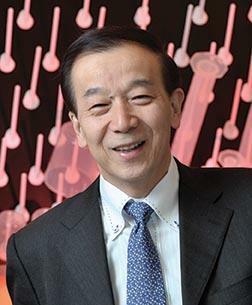 For over two decades, Dr. Yusuke Nakamura has made important contributions to genomic medicine and cancer research. His work has had a significant impact on the progress of genomic medicine worldwide. He is one of the pioneers in variable number tandem repeat (VNTR) and single nucleotide polymorphism (SNP) marker research, and in using genomics research findings to develop clinical interventions. These DNA polymorphic markers have made it possible to map and clone genes responsible for hereditary diseases and various cancers, and to identify those susceptible to common diseases and those related to variable drug response. In recent years, he has been developing anticancer drugs, including antibodies and peptide vaccines, and molecular-targeting small molecular compounds through the discovery of important genes in development and progression of cancers by the genome-wide approach. Dr. Nakamura has published more than 1,300 articles in such publications as the American Journal of Human Genetics, Cancer Research, Genomics, Nature, Nature Cell Biology, Nature Genetics, Oncogene, and Science. In 2010, Nakamura received the Chen Award for Distinguished Academic Achievement in Human Genetic and Genomic Research, an honor bestowed by the Human Genome Organisation (HUGO). Dr. Nakamura graduated from Osaka University Medical School and earned a PhD in molecular genetics from the same institution. He joined the University of Chicago faculty in 2012.